There’s nothing quite like the one-two punch of the Consumer Electronics Show, immediately followed by the SCTE’s annual Conference on Emerging Technologies (ET), to start a new year. The holiday blobbishness melts away. The girding for another year of technological development begins. This week’s translation strolls through a (very) short list of ET tech-talk, culled from 47 pages of notes, and 422 pages of presentations. A big topic, not surprisingly, was the “all digital” cable network, and the allure of renovating those 80 or so analog channels, located between 54 MHz and 550 MHz, into 800 or so digital video streams. Equally tantalizing in all-digital is an extra carrying capacity of 3.1 Gigabits per second (80 channels times the 38 Mbps that comes with 256-QAM, for those who want to do the math). That’s on top of the existing, aggregate digital capacity of 1.3 Gbps, which gathers between 550-750 MHz. The great thing about ET is the volume of weird stuff you probably hadn’t thought of before. One dense but interesting presentation, for example, examined what could happen to common plant equipment, if all the analog restrictions go away. 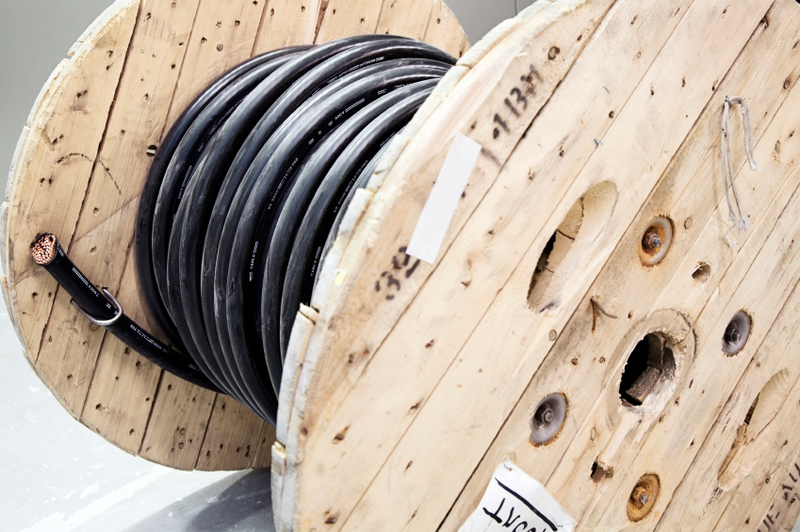 Anyone who recognizes the fact that cable’s upstream path is a gaunt four percent of overall cable bandwidth, should see the good in a little more elbow room down there. What’s being “split” in “subsplit” and “midsplit” is the ratio of downstream (headend to home) bandwidth to upstream (the other direction) bandwidth. In the early days of cable amplifiers, which topped out at 220 MHz, the middle (mid-split) was at about 110 MHz. In today’s world of 750 MHz and 860 MHz amplifiers, a strict midsplit would occur at 375 MHz and 430 MHz, respectively – which sort of makes the term “midsplit” a sweet vestige of times past. When you talk to engineers about subsplits and midsplits, they immediately go into spectrum dialect. They’ll point out that the upper subsplit boundary is at 40 MHz because off-air broadcasts of channel 2 ride at 54 MHz, or that 108 MHz is located at the top of the FM band. All of it references the FCC’s rules on spectrum allocation, and who gets to use what, without interfering with each other. The point to remember is this: “All digital” theoretically unbolts the skinny limits of the upstream signal path, toward a roomier, mid-split border. And rare is the individual who views a roomier upstream path as a bad idea. Clearly, the talk of an all-digital cable plant, and all its nuances, will pervade 2004. However, it’s only fair to point this out: There’s a growing a faction of cable’s technical intelligentsia who view the all-digital cable network as borderline ridiculous. Other methods are cheaper and more effective, they argue, such as gradually dipping digital boundaries into analog spectrum, as needed, or increasing the upper digital border to 860 MHz. Another new nugget from this year’s ET is “ACAP,” which is associated with “OCAP,” which is the “OpenCable Applications Platform” – the industry’s middleware for set-tops, or digital cable ready devices that can support portable (cross-MSO) applications. “ACAP” is one of those nested acronyms, where the “A” is short for “ATSC.” ATSC is the Advanced Television Systems Committee, a broadcaster-heavy technical group that wants extensions for terrestrial nuances to be included in OCAP. Just an FYI on that one – it’ll brew this year. It wouldn’t be ET without heavy doses of impressively nerdy tech-speak. My favorite was this gem: “The technology used in 80 kilometer, 10 Gig optics is a distributed feedback laser with an integrated electro absorption modulated laser.” Got it. All kidding aside: The people who attend ET like it for the opportunity to sit back for two days, programmed to receive, and to connect the dots. If past conferences hold true, much of the information imparted at ET represents the connecting lines. The dots emerge as the year unfolds. By the looks of things, this year will have plenty of dots. I’ll do my best to help you continue to connect them. Last week marked the annual gadget mecca that is the Consumer Electronics Show, which never seems to disappoint in its array of useful, interesting, and just plain weird stuff. My favorite from last year was a his-and-her toilet seat, equipped with red and green lights to alert someone, in the dark, as to whether the seat is up or down. Because the national and trade press teemed with coverage of home media servers, digital and HDTV sets, and the widening array of devices that do better with broadband connectivity, this column will instead attempt to translate the working challenges of the consumer electronics (CE) community, as it continues to try to work together with cable. There are a few plain truths about the CE industry that differentiate it from cable. First is extreme cost sensitivity. Every quarter, CE manufacturers confront a grim shuck and jive to achieve even single-digit margins. Every nickel of cost is real. Every flopped gadget is blood on the bottom line. Every bottom line is a gasping game of endurance. Because of the thin margins on manufactured products, CE companies are increasingly interested in finding higher-margin wares. This may mean services, or hardware capabilities that require two-way connectivity. Maybe there’s a hard disk in a TV, which turns it into a digital video recorder. Or maybe there’s a wireless keyboard that lets a TV collect entertainment from a remote server – cable’s or otherwise. These are natural collision points, or at least a difficult batch of negotiations. Another working challenge for CE manufacturers is pricing expectations. Fierce competition in the CE world conditioned us all us to expect regular and dramatic price reductions on the various products they make. Witness that pre-Christmas Wal-Mart stampede to a stack of astoundingly cheap, $40 DVD players. A third CE challenge is constancy, which has a co-dependent: Quantity. Together, constancy and quantity advance the expected theater of price cuts. Gizmos that don’t change can be scrutinized and honed for cost efficiencies; cost efficiencies drive volume. Gizmos that do change remain expensive to produce. The stability thing is hard for cable. Upgrades become difficult. Consider a “cable-ready” CE device that lacks sufficient processing power or memory to accept a software download of a new service that comes along, say, three years after a consumer purchases the device. Then what? The perennial problem of cable’s legacy set-top base, and its inability to do more than it already does, morphs into a problem of a cable/CE legacy base that can’t be switched out, because it’s glued together. If your house is like mine – a geek-o-sphere – you probably have piles of chargers for piles of small, electronic devices that you no longer use. Now imagine a pile of large electronic devices, no longer used. Eek. The perfect cable world, in the eyes of a CE manufacturer, is one that offers simple “rights of attachment” rules for their gadgetry. Gizmos attach to cable plant, bandwidth-hungry services spill into them, everything works just fine, end of story. Beyond making cool things that consumers want, CE, in its perfect cable world, carries no obligations except to “not harm” the cable network. Those were simpler times, before digital set-tops came in, with stacks of software, and two-way connectivity, and an assortment of interactive applications – the guide, VOD, SVOD. The concern now is this: A person brings home a CE device. It contains, within its plastic housing, some form of cable set-top box. Something goes wrong. How is the problem isolated, let alone corrected? You can’t exactly ask a customer to remove the back of the set. Cable’s view of a perfect CE world is, not surprisingly, somewhat different. It starts with a desire for device performance that is at least equivalent to contemporary cable set-tops. That means enough processing power and memory to mirror the requirements for OCAP middleware, applications, navigational systems, and security. It also means avowing to the inevitability of change – so that if a popular new service enters the scene in future years, it can be downloaded and accommodated in software. The working challenges of the CE community are real. Just as real is the need for both sides to work through those challenges, to uncork the innovation in devices that work better with broadband. The answers started to unfold last year. They continue to progress at a (very) accelerated rate. Just because something is hard, doesn’t mean it can’t be done. There’s a light at the end of this tunnel, and it shines on something slightly more important than the toilet.